Doing some sorting out, this small collection of cardboard single sleeves amassed themselves recently. Sturdier than paper shop bags, they still turn up in amongst boxes of second hand singles having done service for fifty years or more. And like the shop bags, they help document retail outlets now mostly gone. 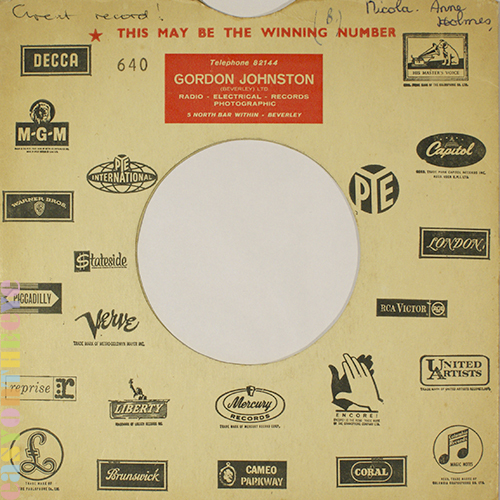 Most of these sleeves were for shop use only; the single and paper record company bag (of which we have a few pages on the site) would be kept inside these card outers, which were marked up to help assistants find stock. But inevitably some did get handed out. 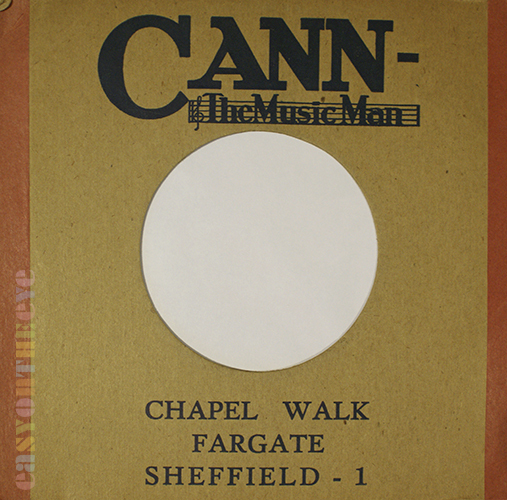 CANN’s in Sheffield is documented on the site already; this brown sleeve is from their later Chapel Walk shop in the sixties, and is positively minimalist compared to the earlier over the top looking designs which appeared on 78s. 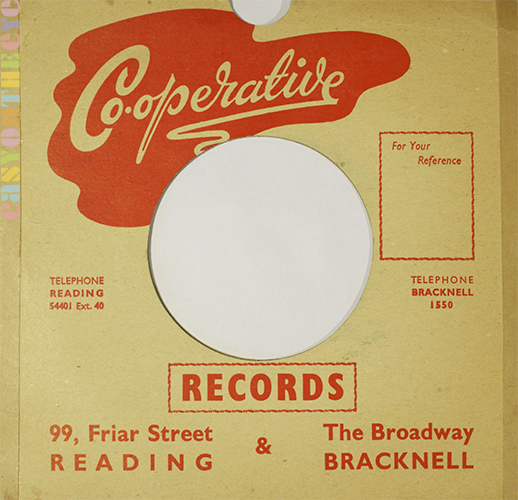 Many Co-op shops had dedicated record departments, as this sleeve from the READING and BRACKNELL CO-OPERATIVE branches (one sleeve, two sites) confirms. I like the swirly Co-Operative logo design, probably older than the sleeve itself, which looks to be from the fifties. 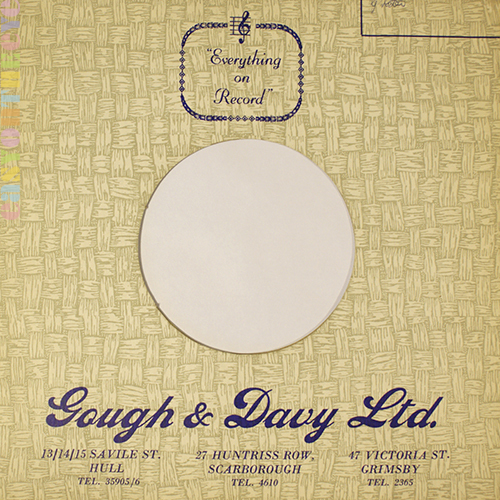 GOUGH & DAVY Ltd. is a name I’ve seen on 78 sleeves, and looks to have been a small chain from East Yorkshire and Lincolnshire, the three towns on the bag being quite a way apart but manageable. Incredibly the name is still going, albeit in their main business as a piano retailer. As such they opened back in 1860, are are now based in an early shopping mall under Hull City Hall, though their record selling days are long gone. This sleeve must be from the fifties and has a Trompe-l’œil basket weave pattern printed across both sides. 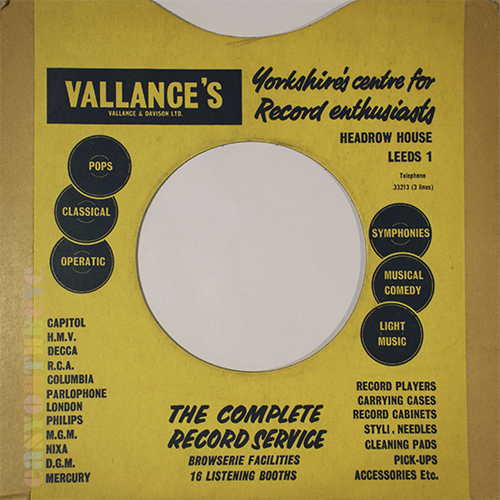 “Everything On Record” is the shop’s no nonsense boast! JEAVONS RECORDS in Newcastle are fondly remembered on many forums discussing the history of the North East, but with precious little detail. They had two shops in the city, and two more not far away in Darlington and Wallsend. 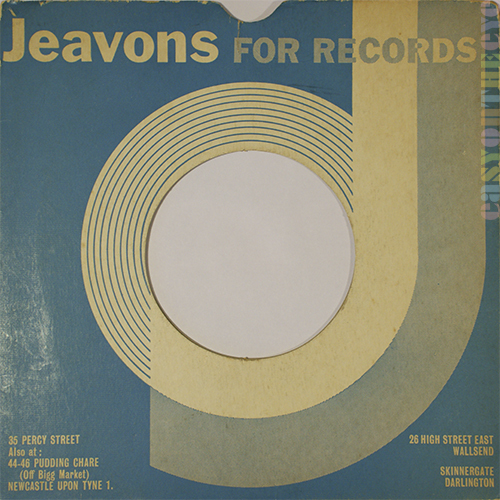 This was typical of a small local retail operation, The groovy shop sleeve looks to be from the sixties and wraps the J logo round the centre cut-out in some style. I have found some more bags and detail about Jeavons, which are on a separate page. 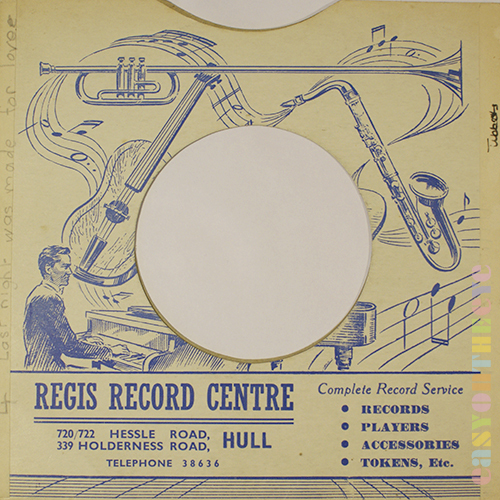 Back to Hull for REGIS RECORDS, and a bespoke fifties sketch of swirling music staves, instruments and a pianist decorate their sleeve. This shop must have lasted for over 50 years and was still going in the early 2000s and the era of plastic shop bags but has now gone. 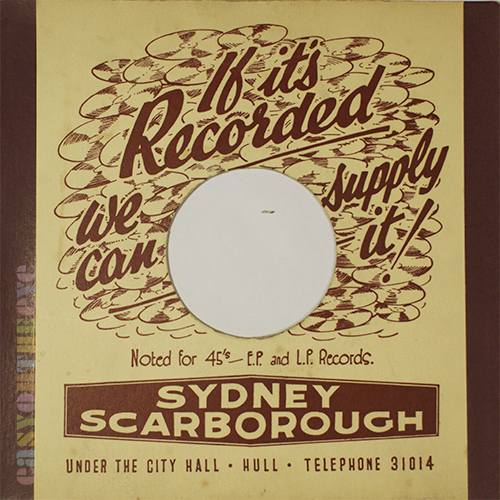 SYDNEY SCARBOROUGH were the best known of the thirty or so Hull record shops which existed at one time or another, and I can remember visiting them in their large shop under Hull City Hall as a teenager. 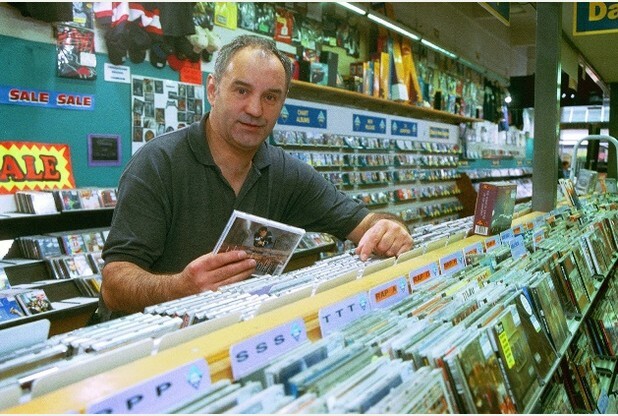 Again there is very little detailed information on the web about the shop, although the local paper seems to have photographed the manager Paul Webb in store not long before the place closed. 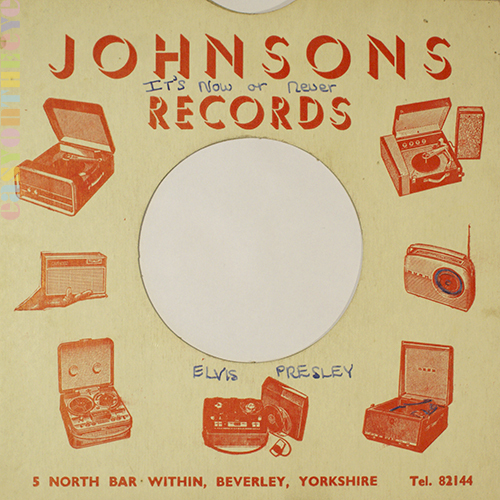 This 7″ sleeve probably from the fifties is completely hand drawn, right down to the type and logo (in their usual brown house colour). “If it’s recorded we can supply it!” shows they were doing battle with Gough & Davy’s claim above. 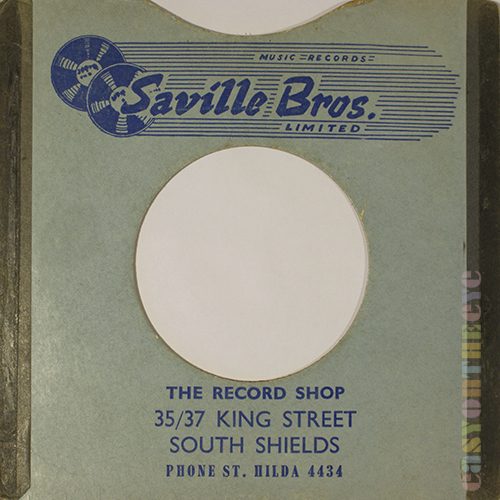 SAVILLE BROS. in South Shields also had their printer come up with a contemporary looking logo, very forties looking. The shop probably opened before the war, and the last manager began work there on a temporary basis in 1949 when the boss, his Dad, became ill. He stayed on until the shop closed for good in 1977! It was originally in King Street and later moved to Keppel Street. Locals still recall signing sessions when stars of the fifties and sixties would turn up. Ivor Saville also owned a second shop in Sunderland. They had a listening booth with the records relayed down a telephone receiver from the counter where the boss would put the record on by request. You would listen to the disc as if on the phone. Bizarre! Lastly for now VALLANCES. This chain of electrical retailers had numerous shops across the North dating back to the 1920s, but also went into record retailing in quite a big way during the sixties. Many of their card sleeves list lots of stores but this one is dedicated to the big Leeds branch, with an amazing 16 listening booths. And I bet there were still queues on a Saturday. There is an image of one of their paper bags on the site. Needless to say if anyone has recollections of using these shops or worked there, do get in touch.